New! Turkeys Gang up on Staten Island Residents Turkeys seem to be getting even with New York residents by ganging up on them! Find out what's being done about it and why the turkeys have become a problem. Fast Facts and statistics about U.S. Commercial Farming and how they create jobs and revenue for the United States. Now that's a lot of eggs! In spite of the obvious rise in backyard, urban chicken keeping, individuals who have never raised chickens before commercial egg production is on the rise. The commercial egg and meat industry has actually went up by 2%! The most recent statistics about Commercial egg and broiler production indicate that production levels went up by 2% in March 2013 according to the USDA report-Chickens and Eggs. "All layers in the United States on April 1, 2013 totaled 348 million, up 2 percent from last year".. (USDA, 2013). Of these 348 million there were 292 million layers producing table or market type eggs. There were 3.11 million laying hens producing eggs (produce baby chicks). 75.6 eggs per 100 layers, up 1% from April 1, 2012. These statistics do not include laying hens, broilers, and eggs produced by backyard, urban flocks owned by individuals. Now folks-that's a lot of eggs! Where you can find the best deals on chicken (poultry) supplies, small farm supplies, and western wear. Check out more news about chickens! 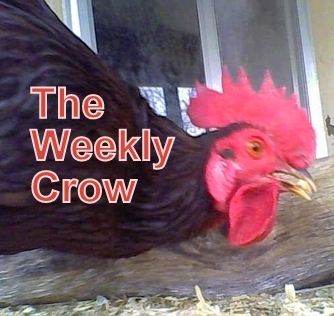 Welcome to The Weekly Crow where you will find the latest news, statistics, and reports about chickens in the news. All Commercial Egg Statistics Commercial Farms Eggs Statistics About Farming In The U.S.